Dreading Year-end Reviews? Then ace them! Are you prepared to ace your year-end performance review this year? This first of a two part series ezine is packed with real world and instantly usable tips and techniques on how to better prepare yourself for the performance review just around the corner. 3) Do you know how it works in your company? 1) Are you the world's fastest Indian? 2) Are you following your passion? 1) 10 steps to ace it! It is almost year-end performance review time...at least if you happen to be working for a company where this is part of the HR system. Getting great performance reviews is closely linked to your career. You can either leave it up to the system to deliver just another review or you can do something about it to make sure you get at least a decent review. Want to know the best performance review tip?...start by defining what you want to get out of it. Key to understanding performance review is to first understand your system ...know this and you can play to win the game! Preparing for Performance Review? ...make sure you get to have your say by preparing in advance. Follow these simple steps to set up a system and collect the right data. A great book with lots of useful words and phrases to use that will give your reviews the edge! Getting ready to write your performance review?...Then, follow these five simple steps to create a high quality outcome as you write your performance review. You have a golden opportunity to position yourself in the right way as you hand over your review to your boss. Learn what to say and do. "If you don't live your dreams you might as well be a vegetable"
These words were said by the world's fastest Indian who went on to live his dreams. Are you living yours...or at least working towards it? Feeling a bit low and want to get that burst of energy to get you going? Then you've got to check this out. These downloads are for you as a thank you for subscribing to the ezine and blog. Liked what you saw here? Want to get the remaining set of tips to really ace your reviews? 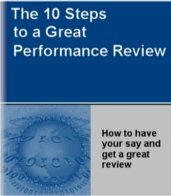 Then don't forget to stay tuned to Part 2 of the Performance Review series which will cover the remaining 5 steps of the 10 step process in detail.